After investing an undisclosed amount in a mobile-based beauty and wellness platform Vyomo, Cricketer Yuvraj Singh’s YouWeCan venture has invested an early-stage venture fund in healthcare marketplace Healthians. Seems digital market place has become a hot favourite of Cricketer Yuvraj Singh. His YouWeCan venture has invested an undisclosed amount of seed fund in a mobile marketplace Vyomo in the recent past and now, in a recent development, it has invested an early-stage venture fund in an online marketplace for preventive health check-up – Healthians.com. The online healthcare website is run by Expedient Healthcare Marketing Pvt Ltd. Since its inception in the month of April this year, the YouWeCan venture has invested in four projects including On-demand logistics tech startup Moovo, beauty & wellness services startup Vyomo and online education services marketplace EduKart.com, which is the latest one along with the Healthians.com. As suggested earlier in his previous comments, Singh once again remained intact with statement of investing in healthcare sector to promote preventive healthcare after facing a tough time in past while taking treatment for Cancer. “Having gone through a life-threatening medical condition, I am extremely keen to promote preventive healthcare in India. While most of us today have an online social profile or an online professional profile, there’s a large need to use technologyto create and track individual health profile. I am excited to see Healthians trying to solve this problem,” noted Singh. Founded by Deepak Sahni, who has over a decade of experience as Director in Sai Webtel Technologies Pvt Ltd, Healthians.com is an online marketplace to help users discover affordable healthcare by aggregating diagnostic labs, crowd-sourced sample collectors and make patient’s medical records available online. 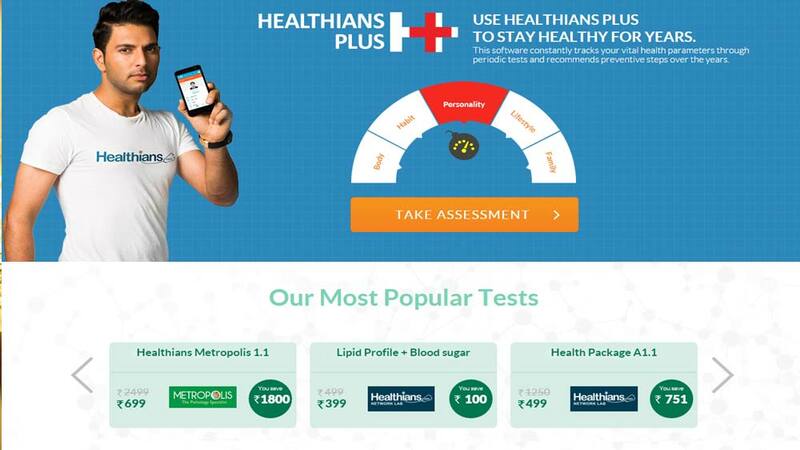 “Healthians’ proprietary self-assessment software ‘HealthiansPLUS’ has been created with the help of leading doctors along with software engineers. Users fill online questionnaire, followed by free personal visit by a wellness consultant for further screening. The software establishes user’s personal health score, recommends future health checks and tracks each user’s health over his lifetime,” informed Sahni. Reportedly, the company has raised an undisclosed amount in seed funding in September 2014 from healthcare-focused startup accelerator Healthstart. Currently, the company focuses in Delhi NCR region, though, catering to consumers in 22 cities across India. It plans to expand into 50 cities, profile over 1 million users for Healthians+, crowd source over 1,000 mobile health advisors and conductmore than 200,000 tests in 8-12 months, as suggested on theofficial website of the online marketplace. Global ingredients mkt to reach $17.6bn..